This machine is PLC controlled with cutting dimensions set by terminal input. All operation are executed either manually by the operator or automatically by the program carrying out parallel cuts with max 8 different dimensions repeatable up to 1999 times. The switchboard, with operation buttons, programmer and liquid crystal display on it, is mounted on the right hand side of the machine. The switchboard make operator easily to control the machine from the sawing area when the stone is being positioned. The saw is equipped with a laser illumination system to aid in lining up the cut. It’s blade head can be rotated at 90 degree The cut is controlled through an inverter. The bridge cutting machine adopted monoblock crossbeam automatic moving technique, front-back, left-fight, up-down locate automatically, and blade adapter can move left and right, also the workbench can automatically turn the slate up to an angle of 85 degree. This stone cutting machine controlled by microcomputer, automatic cutting completely, the main electrical parts and components of the bridge saw machine (such as laser reticule apparatus, magnetic rule, frequency converter etc.) are all of imported good-quality materials, that pledge the bridge cutting machine have high precision. The switchboard on the bridge saw machine, with operation buttons, programmer and liquid crystal display on it, is mounted on the right hand side of the machine. The switchboard make operator easily to control the machine from the sawing area when the stone is being positioned. Stone cutting machine adopts automatic programmable electric controlling device and fluid drive device to assure stable quality and excellent cutting performances. With integrated structure, the bridge cutting machine features high strength, deformation resistance and long service life. It is particularly applicable to cutting valuable and large stone plates. 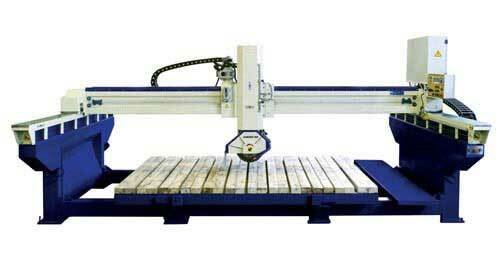 With frequency control, the bridge cutting machine runs steadily and has less risks of damage. Yuxiang is a specialized manufacturer of stone cutting equipment, including bridge cutting machine, stone cutting machine, bridge saw machine, granite cutting equipment, floor cutting machine, granite cutting machine, marble cutting machine, stone cutting equipment, bridge cutting granite saw.